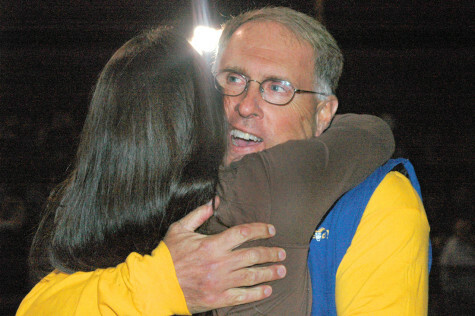 News of principal Dan Meier’s retirement spread like wildfire through school halls and social networks Jan. 2. Along with this news and its accompanying sorrow, one question echoed in the minds of students: who will fill Meier’s shoes? Beth Boivin, FCPS Administrative Employment Specialist, said the process of applying for a principal position is multi-layered and confidential, with multiple steps through which candidates must proceed. The first of these is for county administrators to invite a select number of candidates, chosen based on characteristics gathered from the school’s community, to a panel interview. In addition to school-selected traits, panel members seek a series of standard skills, listed on the FCPS, in candidates. These include the ability to plan and assess secondary school facilities, as well as lead instructionally and manage community relationships. Assistant principal Scot Turner said this first step in the process is probably the biggest hurdle toward acquiring the job, since it requires the approval of a full panel of community members. Following the panel, the Cluster Assistant Superintendent (CAS) reviews applicants’ personnel files and conduct lengthy follow up interviews with top candidates. The final candidate will then interview with the Division Superintendent. Lastly, the CAS contacts multiple school board members, including those representing the school needing a principal, to discuss the candidate’s compatibility with the school’s community. After receiving approval from the Assistant Superintendent and input from all school board members, it is finally time for the candidate to introduce themselves to the students and teachers over whom they will preside. Meier said, while he found the school’s size daunting at first, he quickly came to appreciate its culture, and hopes the next principal will be able to do the same.